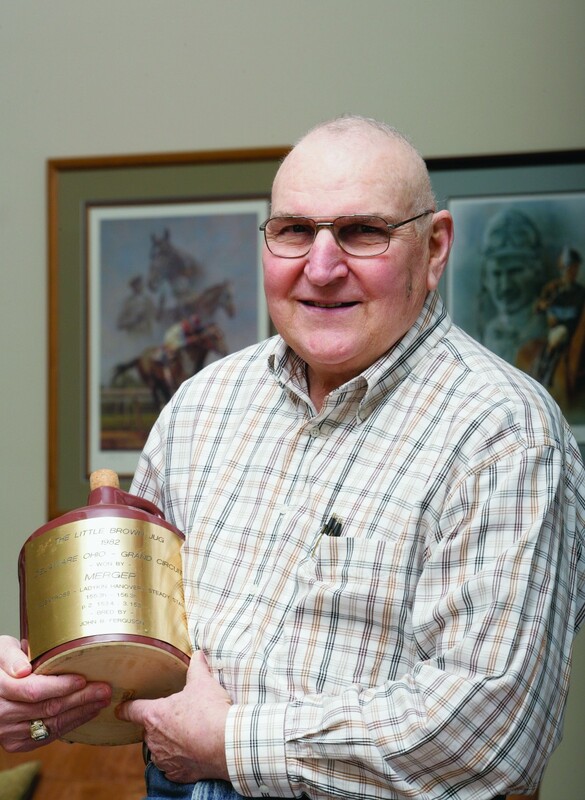 John Ferguson grew up around old Hastings Park in Vancouver, BC, following his father and uncle, both Thoroughbred horsemen, to the track, and spending most of his summers working in the backstretch. When Ferguson was firmly entrenched as an NHL player with the Montreal Canadians, he became a fixture at Blue Bonnets Raceway, one of Canada’s premiere harness tracks at that time. Ferguson ventured into harness horse ownership in the early 70s when Del MacTavish Sr. and Roger White drafted him into an ownership team with a trotter called Harlan Marv, who would go on to be a star. Ferguson later teamed up with the Stall Family in forming Double Two Ranch and they campaigned horses such as Keystone Sandra and Comet Angus.? Keystone Sandra came within a nose of beating Handle With Care in the Betsy Ross Stakes at Yonkers Raceway in New York.? Comet Angus won the Jockey Club Futurity at Garden City. Later, heeding the advice of prominent Breeder Elgin Armstrong, Ferguson would purchase fillies with breeding potential.? He immersed himself in the market, at one point owning 13 mares and nine foals at Hanover Shoe Farms.? He eventually sold most of the mares except Lady Kin Hanover, the dam of Merger, which Ferguson bred.? Merger was syndicated at the age of two for over $8 million and age three won the Little Brown Jug. As an owner Ferguson’s best horse was Hardie Hanover, a winner of stakes events such as the Fan Hanover and Breeders Crown and over $718,000 in purse money.? She was voted Canada’s Three-Year-Old Pacing Filly of the Year in 1994.? Other horses he owned included Stand And Deliver, Caught My Eye, Armbro Income and Carlys Table. After retiring from hockey, Ferguson became President and Chief Executive Officer of Windsor Raceway and was an enthusiastic participant in any promotion that benefitted harness racing.?? He was also one of the driving forces behind the formation of the Canadian Horse Racing Hall of Fame, and assisted with researching and writing the by-laws.